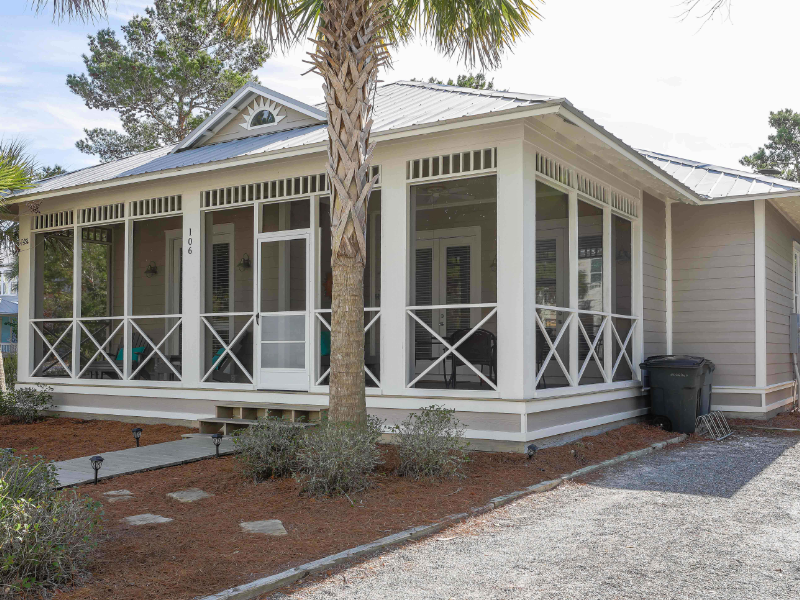 Coastal Brakes is located in Seacrest Beach and offers 4 bedrooms and 3 full baths. This one level home is designed for beach living, for you and your family or guests. The sprawling floor plan offers space for the entire family and room to spare. Enjoy your day meandering through the shops 30a has to offer or enjoy the white sands of the Beaches of South Walton. The main living area, has a beautiful open concept with plenty of seating for everyone to enjoy with oversized sofas, plush chairs and twin-size sleeper sofa. Step out to large screened in Florida room and enjoy the coastal breezes as you take in the soothing sea breezes and beautiful sunsets. The kitchen offers stainless appliances and open view to the living and dining area. The dining area has seating for 8 at the table and an additional 4 at the breakfast bar leaving plenty of elbow space for the entire family. The master suite is located off the living area, with a king size bed and a twin roll-a-way for an extra guest. The large ensuite offers a walk-in shower with rainfall shower head, and double vanities. There is access to the large screened-in porch from the master suite. The queen guest bedroom has a shared bath, with access to the rear porch. The second hallway houses two bedrooms, one with a king bed, one with a queen bed and twin daybed with trundle that share a hall bath. The king bedroom also has access to the rear porch. This home offers space for the entire family, or mixed family vacations. You will find TV’s in every bedroom and family room.